No word in the English language rhymes with month , orange, silver, or purple. Our eyes are always the same size from birth, but our nose, and ears never stop growing. The sentence: ‘The quick brown fox jumps over the lazy dog’ uses every letter of the alphabet. The words… ‘racecar,’ ‘kayak’ and ‘level’ are the same whether they are read left to right or right to left (palindromes). There are only four words in the English language which end in ‘dous’: tremendous, horrendous, stupendous, and hazardous. 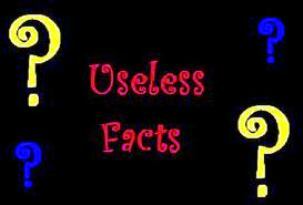 There are two words in the English language that have all five vowels in order: ‘abstemious’ and ‘facetious. Admit it, you are going to check it out and say, a-e-i-o-u….Right? A goldfish has a memory span of three seconds. Some days that’s about what my memory span is. A snail can sleep for three years…I know some people that could do this too! You’re currently reading “AMAZE FRIENDS WITH USELESS FACTS,” an entry on Harvey Tobkes.